Imagine stepping off the subway at the 175th Street Station in Manhattan and the next thing you know, you’re setting foot in the Adirondacks. Fantasy? Not quite, for there is in fact a direct connection between these two sites – although admittedly it’s no short cut – rather it’s the “Long Path,” one of New York’s signature long-distance hiking trails. Originally conceived in the 1930s as a wilderness corridor that would link New York City to the High Peaks, the trail has been developing over many years, a labor of love on the part of volunteers of the New York-New Jersey Trail Conference. 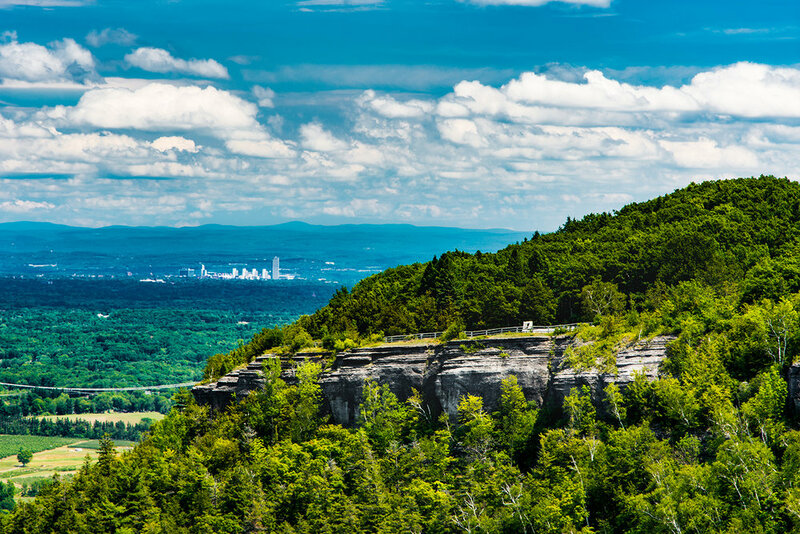 Today, it reaches 358 miles from that subway station all the way to the John Boyd Thacher State Park just west of Albany. For now, that’s the northern terminus, although a preliminary route to the Adirondacks has been blazed. Those first 358 miles are worth checking out, because they pass through some of the most gorgeous natural areas in the Hudson Valley. After you leave the subway station, the Long Path takes you over the Hudson River on the George Washington Bridge and then follows a dirt path atop massive granite cliffs with panoramic river views. A few miles further north, you’ll find yourself in Harriman State Park, New York’s second largest state park with 47,000 acres and over 200 miles of trails. Here the Long Path passes right next to Big Hill Lean-To, a great place to camp for the night, and admire Manhattan’s proud spires some 30 miles south, glowing in the darkness. The Long Path got its name from the opening stanza of Walt Whitman’s Song of the Open Road: “A long brown path leading wherever I choose.” At some point the word “brown” was dropped from the trail’s official name, but here and there you might still find an ancient blaze labeled “The Long Brown Path.” Whitman was a great lover of New York City and its crowds, but he also loved to take long walks through nature. A statue of this great poet – whom some critics regard as on par with William Shakespeare – stands in Harriman not far from the Long Path, and it would seem that his spirit watches over the trail, and perhaps inspires the current generation of saunterers. After weaving through the quiet glacial valleys of Harriman, the Long Path scrambles up the purple puddingstone conglomerate of Schunemunk Mountain – indeed, the Long Path is a study in contrasts, with seemingly no two miles alike – for the next thing you know you’re walking along a rail trail through the Wallkill River Valley past quaint towns and the rich black dirt of local farms. And then it’s into the rare pitch pine barrens of the Shawangunk Mountains and onto gleaming white glacially-scoured rock faces on top of the ridge, where you can see for over 100 miles. The New York-New Jersey Trail Conference is a not-for-profit organization founded in 1931, whose volunteers today are responsible for over 2,100 miles of trails in the broader New York City area. About 250 volunteers are involved with the Long Path, headed up by Long Path chair Andy Garrison, who fell in love with the trail while thru-hiking it with his son. Under Andy’s leadership, the Long Path has been significantly improved: land parcels acquired, sections moved off-road, stone steps built into steep sections of the trail, and new bridges installed. If you have questions about the Long Path, or need help while thru-hiking, you can connect with Andy and other volunteers through a Facebook discussion group called “Friends of the Long Path.” The Trail Conference makes an interactive map and extensive notes available through its website (nynjtc.org/region/long-path). From the Shawangunks, the Long Path jumps to the southern Catskills, once the tramping ground for the famous East Coast nature writer John Burroughs, who wrote “I go to nature to be soothed and healed, and to have my mind put in tune once more.” In 1885, Burroughs climbed Slide Mountain, the Catskills’ highest peak (4,190’), bushwhacking up the side of the mountain through dense groves of fir and spruce. Today, the Long Path takes you past a plaque affixed to the sandstone slab on Slide’s summit commemorating Burroughs’ life and works. From there, the town of Phoenicia offers a brief respite, but then it’s onto the Devil’s Path, a rugged hiking trail with a fearsome reputation – although nothing that would frighten away tough Adirondack hikers. By the time you’re done with the Catskills, you’ll have summited eight of the region’s 35 high peaks (above 3,500 feet). Are you, like me, someone who’s long been intrigued by the Appalachian Trail but never figured out how to take off for three, four, five months? In this case the Long Path might be a great alternative: it’s an epic thru-hike experience that doesn’t require you to quit your job and leave family behind. It’s also very feasible to section hike the Long Path, since the NYS Thruway (I-87 component) will get you close to most sections. As of 2017, 146 people have completed the Long Path… Maybe you could be the 147th? After the Catskills, the Long Path takes you into the Schoharie Valley, which is full of curious sites: a large reservoir, fossilized trees from Earth’s first forest, a protuberance called Vroman’s Nose (recently donated to the state), the town of Middleburgh, and other nice surprises. When you reach the path’s northern terminus in Thacher State Park, you’ll find yourself standing on the edge of the Helderberg Escarpment, and looking out at the foothills of the Adirondacks – 50 miles to the north. And in due course, the Long Path will take you all the way there. Kenneth Posner (posnerk@gmail.com) of New York City is a volunteer and board member with the New York-New Jersey Trail Conference. In 2013, he completed the Long Path in nine days, setting the current speed record, and wrote about the experience in “Running the Long Path: A Journey of Discovery in New York’s Hudson Valley.” He blogs about running and hiking at thelongbrownpath.com.